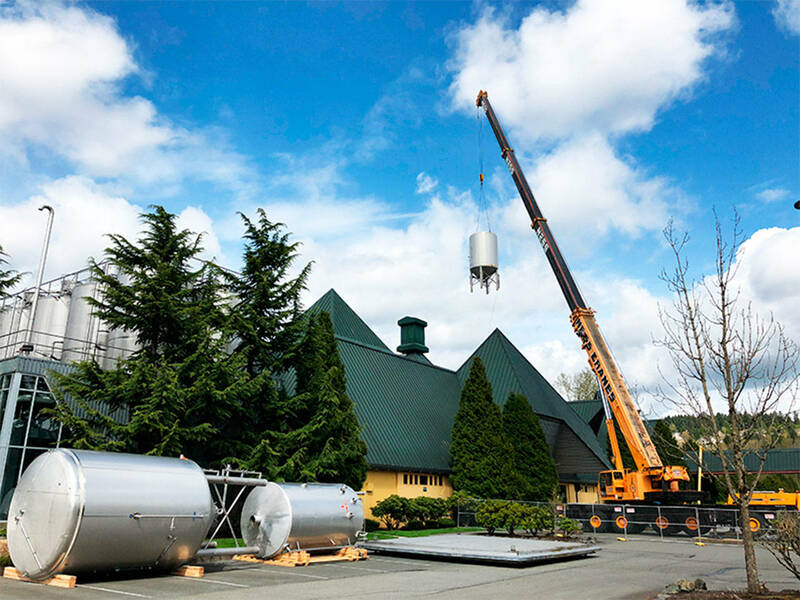 Two local wineries and Teatro ZinZanni will be moving into the old Redhook Brewery in Woodinville this year. Teatro ZinZanni announced in April that it planned on moving into the compound, which was followed by Sparkman Cellars and DeLille Cellars announcing their intention to move in as well. For DeLille winemaker Jason Gorski, the location provides an opportunity to consolidate operations under one roof. “I love getting our entire team in one spot,” he said. DeLille is in the process of renovating the western portion of the north building in the compound. On a recent afternoon, Gorski and marketing director Keri Tawney walked through the large warehouse which used to house brewing vats. Large holes in the concrete floor marked where the vats were plucked from the ground. This warehouse will be adjacent to a new three-story tower and will hold the winemaking operations and act as barrel storage. A two-story glass wall will allow visitors to watch the winemaking team in action. While the winemaking operation will remain around the same size, the major expansion for DeLille will come in the form of additional retail space. The new tower will offer views of the Sammamish Valley to the south and wine club members will be able to access the rooftop. DeLille’s space will be roughly 30,000 square feet and include office and event space. DeLille currently has a winery on Woodinville Drive and a separate tasting room. The winery was founded in 1992 and has been making wine in the Puget Sound region since then. “We’ve always been in Woodinville and always produced here,” Tawney said. The Maison DeLille will continue to operate in Kirkland and DeLille Cellars Chateau will remain open for weddings and events. Sparkman owner Christian Sparkman is also excited to find space in Woodinville and consolidate. Moving operations to the new location will allow them to be more efficient, he said. The space Sparkman will be taking over is the former bottling line room, which is roughly one-third of the building DeLille is occupying as well. It will allow the cellar to hold events and move its two tasting rooms to the old Redhook brewery. The prominent location is another upgrade Sparkman is excited about. Both wineries hope to begin production by the end of this year, with the retail tower scheduled to open next February. A restaurant is also in the works for the site. Sparkman’s current tasting rooms will be shut down and moved to the new winery. Teatro ZinZanni’s founder Norm Langill released a quote on the move. “We are excited to settle in at our new home in the heart of the Hollywood District in Woodinville Wine Country. This is a once-in-a-lifetime opportunity for Teatro ZinZanni to consolidate all our operations under one roof, helping us to open up a whole new chapter for the company,” he said through email. The theater production company is a staple of local entertainment, which produces at least three new shows annually that incorporate comedy, vaudeville, music, dance and circus acrobatics. The company signed a 10-year lease with two 10-year extension options. The company is planning on hosting shows at the old brewery beginning in November. A press release from the company said it will mark the first time all of its operations will be housed in on location, including the scene and costume shops and administrative offices. Teatro ZinZanni was formerly based in Seattle before signing a six-month lease at Redmond’s Marymoor Park that ended in April.